Just a few short years ago, even the thought of capturing an astronomy anomaly with what’s considered an “amateur telescope” was absolutely unthinkable. Who were we to even try to do what great minds postulated and even greater equipment resolved? I’ll tell you who… Bernhard Hubl. Come on inside to meet him and see what he can do! One of the first great minds to consider the effects of gravitational lensing was Orest Chwolson in 1924. By 1936, Einstein had upped the ante on its existence with his theories. A year later in 1937, the brilliant Fritz Zwicky set the idea in motion that galaxy clusters could act as gravitational lenses. It was not until 1979 that this effect was confirmed by observation of the so-called “Twin QSO” SBS 0957+561… and now today we can prove that it can be observed with a 12″ telescope under the right conditions and a lot of determination. Many thanks to Bernhard Hubl for his outstanding sense of curiosity and excellent astrophotography… and to the NorthernGalactic community for the heads up! Very interesting to see what a good 12″ can do! In his web site I see that he has several deep sky cameras which include a ST200XM and a Cannon EOS 1000D. Nice! He also shows that he has 5 telescopes which include 3X 12″ Newtonians and a TeleView NP101! Cool beans at a Bar-B-Que! Who me jealous? Nah… more like inspired! You go Bro! I can’t help but wonder if he would have been able to recognize the ‘lensed’ BG galaxies without the Hubble image to compare? Perhaps there are other astrophotographers out there who might glean similar by going back thru their images and doing the same? I suspect that if there had not been the prior images these would have been overlooked. They probably were overlooked in many prior photographs. However, some digital techniques could be applied to small power scopes to find these in the future. If I were a suspicious person I’d call shinanigans! I meaan come on, his last name is Hubl !!!! Now this is just getting ridiculous. Pro astronomy is becoming obsolete, with this kind of amateur around. Stop it already! Wow, That’s right at the edge of detectability for amateurs. There are larger telescopes in the hands of amateurs but they actually start creeping into pro-astro territory (mirrors approaching 1 meter). I doubt that one could tell the lensing was there in the amateur image without prior knowledge. I don’t think there is anyone with a backyard scope and camera who hasn’t tried duplicating a “big boy” shot. This work happens to be a fantastic picture! I’m not so jealous about the shot itself, It’s making me want to toss the 10″ and go out and get a 12 more than ever before. LBC… now I see why you get so upset with me. You are obviously uncomfortable when someone does something you cannot. Then make (obvious) pessimistic statements as if it wasn’t a big deal. Compensating poser. You obviously haven’t tried to take a long exposure picture to know how difficult it is to have it come out. …and who cares about what they can do in the future, its about it being done today. I could just imagine what you would have said to the Wright Brothers at Kitty Hawk. And he used the Hubl telesope! On the contrary, you seem to have this behaviour every time LBC uses maths that you do not seem to understand. I do not understand everything LBC explains but I do love his explanations because it forces me to go and check deeper about the topics. KBC, HLB, TL are great additions to UT. Please consider recent evidence for alternative gravity effects. 2 billion light year long diffuse difficult to detect plasma filaments 1 million *K were found in the warm hot intergalactic medium WHIM discovery by Taotao FANG. this finding matches the amount of missing visible matter mass from the Big-Bang. It is only 300 million light years away so is the first discovered, but Fang says they may be common in large structures everywhere in the universe. These WHIM’s mostly O-2 some N- both highly electronegative ions somehow absorb x-ray emission jet streams along the line of sight of thousands of galaxies called the sculptor wall. Fang believes all cosmological structures may have these plasma filaments emerging along black hole x-ray emission jets. all Dwarf galaxies even small mass satellite galaxies have central black holes. WHIM plasma gravity can explain why these light outer 2 million star galaxies, and dwarf satellite galaxies, REQUIRE SO MUCH MORE DARK MATTER to keep them from losing their shape and flying apart out into intergalactic space. A filament is extremely diffuse difficult to detect, yet has much mass stretching very long distances can amount to a huge gravitational pull on a star orbiting a black hole at a large distance especially if it is 99% galactic gas by composition rotating charges and not behaving like solid objects. 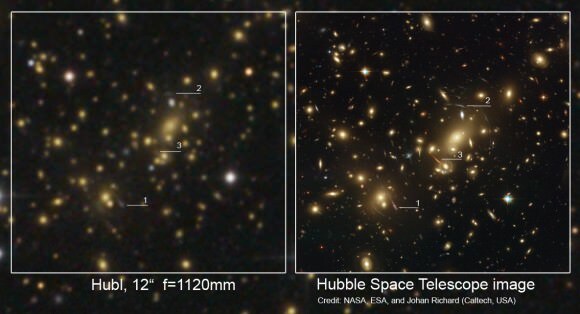 In the case of the gravitational lens, the dark matter would be doing the same thing, keeping lighter mass galaxy clusters from flying away, and requiring them to have a lot more dark matter or light bending around the edges. Previous PostPrevious Is the Moon Really a ‘Been There Done That’ World? Next PostNext Contest: Win Lunar Science Swag!